<---NOT Mary. 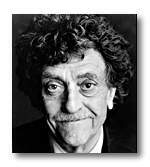 Kurt Vonnegut's picture is here because this article was mistakenly attributed to him when it was sent all across the Internet. Since we don't have a picture of Mary, we decided to leave Kurt here. Just a reminder about how easy it is to fool people! What did P.T. Barnum always say...?